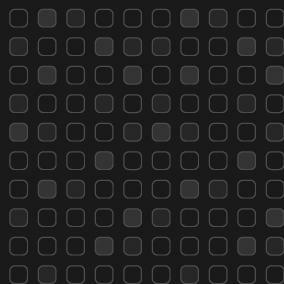 This section is devoted to the creation of short-form videos for a YouTube audience, and blogs for all occasions. I've done some great memorial videos to honor the lives of those who've passed. I do great video portraits of the living too. Couples, friendships, colleagues, groups of all kinds. And I've done thrilling book trailer videos to promote forthcoming novels. Over twenty years ago, I decided to make my first video. It was to be a poetry video based on one of my poems. The video was created for a local cable station. Then Public Television's "Image Union" picked it up. The Chicago Reader and the Chicago Sun-Times both ran feature stories the same weekend. NPR did a whole show on the radio about poetry videos as a new art form. I even got interviewed on the Fox Evening News. The great thing about videos, books trailers, YouTube...is that everyone's doing them. Why not do them a little better than the average Jane or Joe? I can create videos for any event of your choosing. 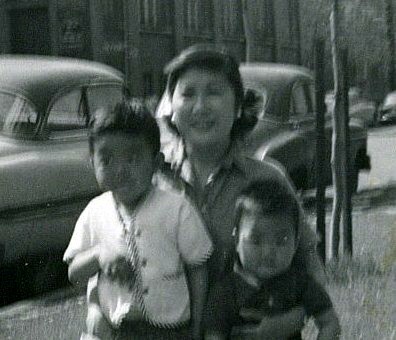 How about a video to thank a friend for their lifelong friendship? Or a video to celebrate a life in music and motion at a memorial service? Videos can make be composed of photographs, video clips, audio, music, subtitling. I'm especially interested in video projects which require a creative touch. Since I am a writer, I am good at helping clients put things into words -- whether in the form of a voiceover or onscreen title. -- I'm able to create compelling juxtapositions of imagery with text. Whether the style needs to be corporate and professional, or artsy and unusual. -- I have a strong instinct for editing footage to music in a way that maximizes the inherent drama in a video. -- My videos continue to engage viewers on many levels -- visually, musically, textually, emotionally, intellectually -- so that they become immersed in the moment of the video. This is a book trailer I made for steampunk author Alison DeLuca for her trilogy THE CROWN PHOENIX SERIES. I used software from Animoto. Hope you like it. I am not a consistent blogger. Sometimes I think my facebook posts are like my real blog. But I've never doubted the value of having a blog, like a diary that is anything but private. Or having a Youtube channel where you can talk about what makes you tick, what unique toys you bring to the table. Below are two blogs. LONG DAY'S JOURNEY INTO DWIGHT is my on again off again blog about being an indie writer, falling in and out of love, and other flotsam and jetsam. 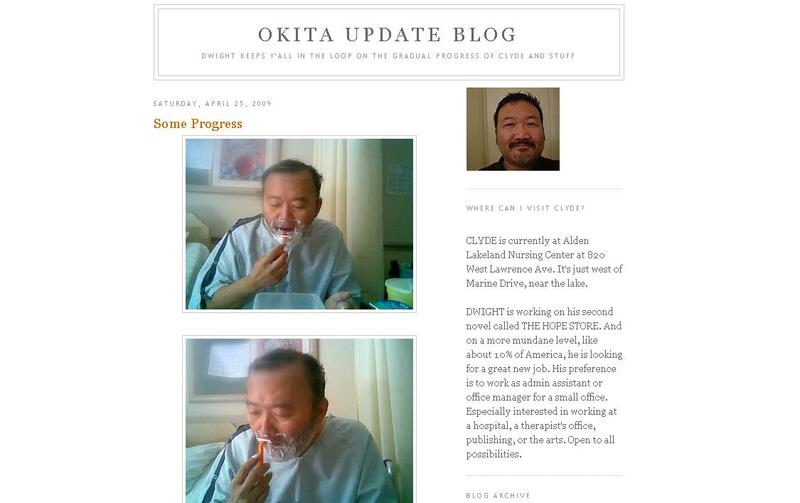 The OKITA BLOG UPDATE was a one-time blog created to keep people in the loop when my older brother Clyde had a stroke. It followed his path to recovery. Blogs can be about whatever you want them to be. And if you're lucky, you'll have many subscribers and go viral and your blog will become a bestselling book which will be transformed into a movie that you will write and star in. Ready to start blogging? I thought so. This is a book trailer I created to raise awareness of my forthcoming novel THE HOPE STORE. I used Windows Moviemaker as my editing software for both videos on this page. I also use Animoto. I wrote the text for the video, found an appropriate music track, photos, and stock video clips. The clips of the falling water droplet are from a DVD I bought of water images from Footage Firm. I will likely be moving away from flat fees to an hourly fee, since most projects seem to take longer than estimated. NOTE: I tend to work with individual artists, or small businesses and nonprofits. The prices below reflect that. I also can work with more professional or corporate-type businesses. Those prices would be likely higher based on the amount of design and tech involved. (Based on the blog design taking about 8 hours). This is a video I created when I was a finalist in the Amazon novel contest.